Turns a target unit into a harmless critter for 3.5 seconds. 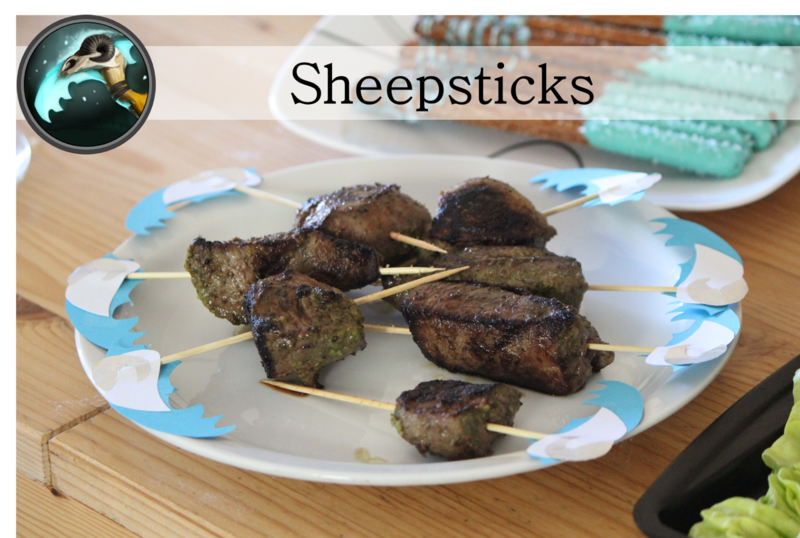 In the words of my friend (imagine, if you can, that these words are being said through a mouthful of lamb), "Oh, I get it, sheepstick because it's sheep on a stick." As far as Dota 2 food puns go (and I've cooked many), this one was pretty tasty. This dish can be prepped easily ahead of time, and then pan-fried in a few minutes when the time is right. (I marinated the lamb right before the Dota 2 International 6 lower bracket final series kicked off, and cooked the lamb in the break before the Grand Finals.) The recipe is adapted from one over at Serious Eats, with some fairly easy crafting additions to make the namesake clearer. I wanted to add the Scythe of Vyse sheep skull to my sticks for decoration, and doubted their ability to withstand cooking temperatures. I therefore cooked the meat before threading it onto the kabob stick. To simplify preparation required during the between-game breaks, I omitted adding vegetables to the kabobs. Cut the lamb into 1-1.5 inch cubes, and place into a large ziploc bag. Blend together cilantro, garlic, dates, spice, lemon juice, oil and salt until smooth, and pour over the lamb. Seal the plastic bag, and marinate in the fridge for 4 hours, or overnight. Heat a skillet up to medium-high heat with a tablespoon of oil. Working in 2-3 batches, fry each lamb cube on four sides for 2-3 minutes per side. Check one piece to see if it is sufficiently cooked (Internal temperature registers 140 F, or to your liking). Let each piece rest on a plate, covered in aluminum foil, for 5 minutes, then thread on a Scythe of Vyse skewer (see below) and serve immediately. 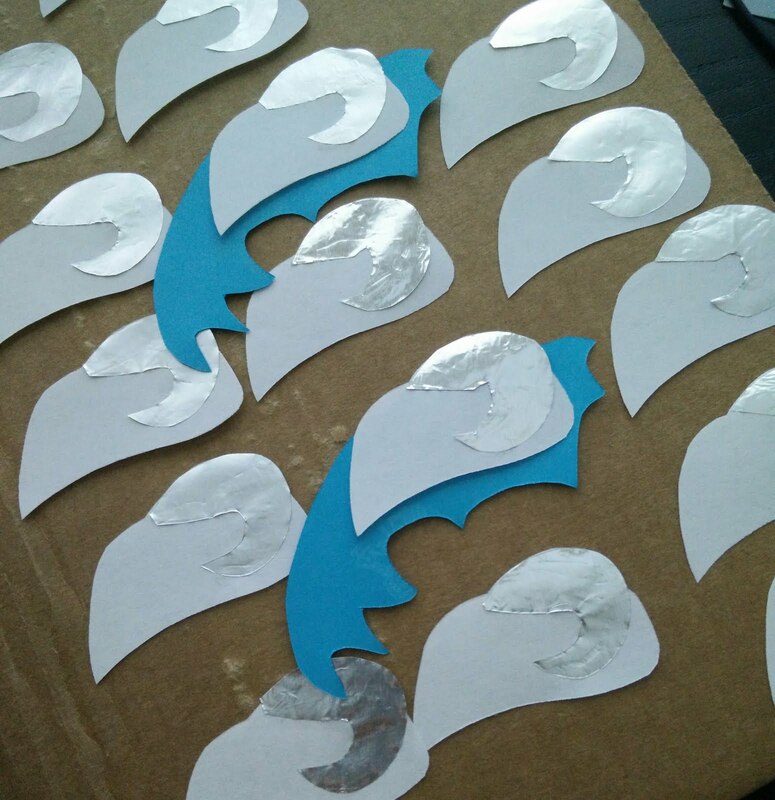 I created a stencil for the sheep skull portion, for the horns, and for the blue splotchy bit, and used them to create cut-outs from white paper, blue paper and aluminum foil. I then glued the foil onto the skulls, and used double-sided tape to fasten the skulls and the blue splotchy pieces on either side of a kabob stick. The shapes were quite simple, so this went pretty quickly - much faster than the Aghanim's Scepter cakes I made using a similar approach. The lamb turned out tender and flavorful. The cilantro garlic sauce was fantastic. I'm a sucker for really bad puns, so all-in-all I think this dish was a success. I've also finally answered the age-old question of why Scythe of Vyse is called Sheepstick if it turns you into a pig. These sheepsticks are good enough to pig out on.